AARP Foundation Tax-Aide is looking for volunteers to provide free tax help during the upcoming income tax season. You don’t need to be an AARP member or have an accounting degree to pitch in. Training will be provided for volunteers of all experience levels. Looking for a rewarding opportunity to make a difference in Kitsap County? AARP Foundation Tax-Aide — the nation’s largest free tax preparation and assistance service — is now seeking volunteers for the 2014 tax season. You don’t have to be an AARP member to volunteer and you don’t have to have any experience doing taxes. You just have to have a desire to help your neighbors. 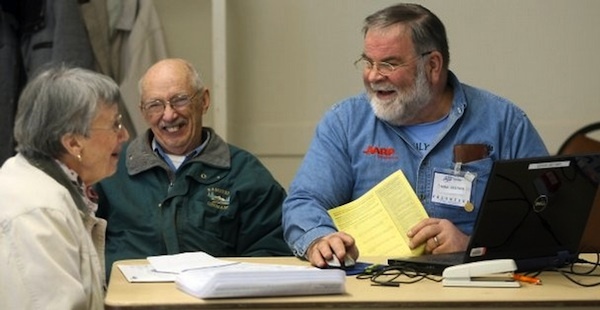 Tax volunteers receive free tax training in December and January, in association with the IRS. Once trained, they work a few hours a week from late January through mid-April, interacting with clients by filling out tax returns. Even if you don’t have accounting or tax preparation experience, becoming a tax volunteer may be right for you, if you have a knack for working with numbers. To volunteer, go to www.aarp.org/taxvolunteer. About half way down the page you will see “Become a Volunteer for Tax Aide”. Fill out the on-line application. Get the joy and satisfaction of helping others by applying to join the AARP Foundation Tax-Aide volunteer team today. Your expertise will be appreciated more than you can imagine. I wrote a story about the five-year anniversary of Peninsula Cancer Center for our Monday paper. One of the center’s medical neighbors in Poulsbo, InHealth Imaging, also celebrated a milestone recently. The office introduced a 3Tesla magnetic resonance imaging (MRI) machine, which it says is the first of its kind in the West Sound region. The 3T MRI uses a more powerful magnet, and offers a wider opening for patients, faster exam times and higher resolution images, according to a news release. InHealth also added a 64-slice computed tomography (CT) scanner, which uses lower levels of radiation and provides better images than older CT machines. This system will allow us to have one of the widest ranges of imaging capabilities while being able to cater those services to patients in almost any situation,” InHealth founder Dr. Manfred Henne said in the release. InHealth Imaging is a private outpatient practice located at 20700 NE Bond Road. It offers a wide spectrum of imaging services including 3D mammography. More Kitsap County residents were working in August, and more were looking for work, according to a monthly labor report. But fewer people held jobs with Kitsap employers. It’s typical to see a decline in employment toward the end of the summer as season winds down and young workers head back to college. The drop off was especially precipitous this year among Kitsap employers, according to Employment Security Department estimates. The agency reported a drop of 1,100 jobs in the county between July and August. We thought the little building at the corner of Charleston Beach Road and Highway 304 was being outfitted as a convenience store. Turns out it will be a convenient marijuana store. A sign went up recently at the vacant Navy Yard City shop for a business called HWY 420. The state Liquor Control Board received a retail marijuana license application for a business of the same name. The application hasn’t been approved yet, but an industry source says HWY 420 is poised for an October opening. Some of the signage required by state law has already been posted on the windows, along with the hours of operation. The store is located just outside Bremerton city limits. It’s next to the Bug Museum and Cliff’s Cycle Center. 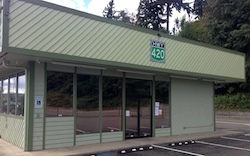 HWY 420 could be the third retail pot shop to open in the county, joining the two approved in Port Orchard. 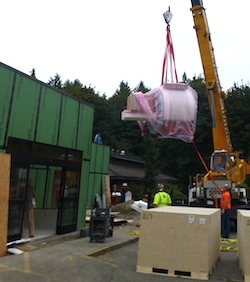 A planned birth center for Kitsap County took a step closer to reality this week. Donors pushed the fund drive for Salmonberry Community Birth Center over the $35,000 mark Tuesday, exceeding the organizers’ goal of $33,000. More than 525 people gave money to the effort. “Obviously this could’t have happened without amazing community support,” said Annie Moffat, a midwife and Salmonberry organizer. The effort is backed by a group of local midwives and doulas who want to give Kitsap parents an alternative to home births and hospital births. The group is searching for a location in Poulsbo or Silverdale. They expect to open the center in the spring of 2015. See the Salmonberry website and Facebook page for more information. No longer Garguile’s, the Red Apple on Perry Avenue will debut Oct. 3 under new ownership. The East Bremerton grocery store changed hands at the end of August when its longtime owners, the Garguile family, declined to renew a lease on the building. Perry Avenue Mall owner Michael Thai stepped in to operate the grocery. A grand reopening event is scheduled for 4 p.m. Oct. 3. Mayor Patty Lent and Bremerton Chamber of Commerce officials will attend. The Garguiles ran the Red Apple for more than 25 years. Thai is looking for a new owner for the Perry Avenue shopping center. Mason County is quietly providing fertile ground for legalized pot grows. Five recreational marijuana producers were given the Liquor Control Board’s blessing this year. The growers are scattered across rural areas of the county (expand map for a better view). Three of those businesses are also licensed as processors, meaning they can turn harvested buds into products like oils and edibles. Pot entrepreneurs submitted 20 retail applications in Mason. Six were proposed for Belfair and one for Allyn. No retail outlets have been approved to date. The state will allow up to five stores in the county, including one in Shelton. The liquor board had approved three marijuana grows and two retail shops (both for Port Orchard) in Kitsap County at last count. Mason County commissioners earlier waffled on a marijuana moratorium, drawing ire from I-502 business applicants. Nearly six hundred more Kitsap residents were living in poverty last year than in 2012. And while the county’s poverty rate is low compared with other areas, it continues to rise. An estimated 27,727, or 11.3 percent of Kitsap residents, were living below poverty levels in 2013, according to numbers released this week by the U.S. Cenus Bureau. By comparison, the Census estimated 8.5 percent of the Kitsap population, or 20,400 residents, were living in poverty in 2006. The state poverty rate rose to 14.1 percent in 2013, with an additional 50,000 Washingtonians falling below poverty levels. The U.S. poverty rate remained flat at 15.8 percent. According to the University of Washington’s West Coast Poverty Center, the continued rise of poverty rates, coupled with a widening income gap, suggest economic gains have yet to benefit many low-income residents. See the center’s full analysis here.